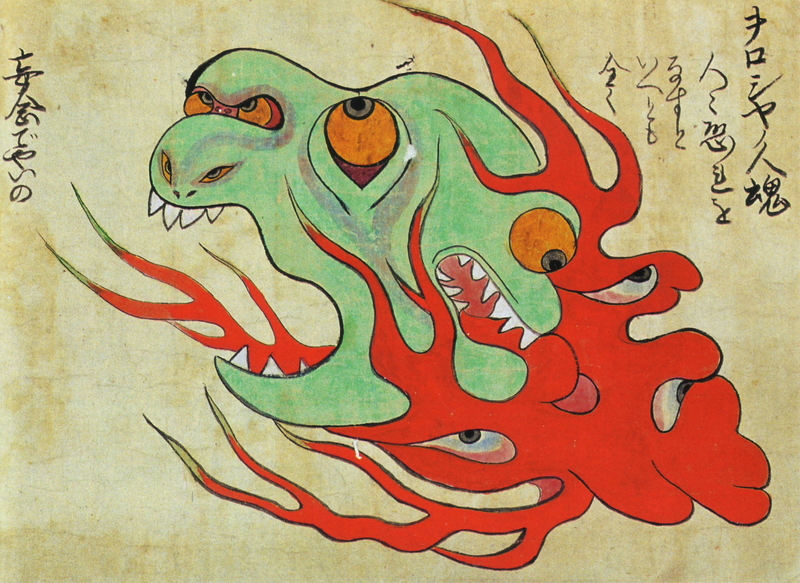 Here is a look at the Kaikidan Ekotoba, a mysterious handscroll that profiles 33 legendary monsters and human oddities, mostly from the Kyushu region of Japan (with several from overseas). The cartoonish document, whose author is unknown, is believed to date from the mid-19th century. It is now in the possession of the Fukuoka City Museum. 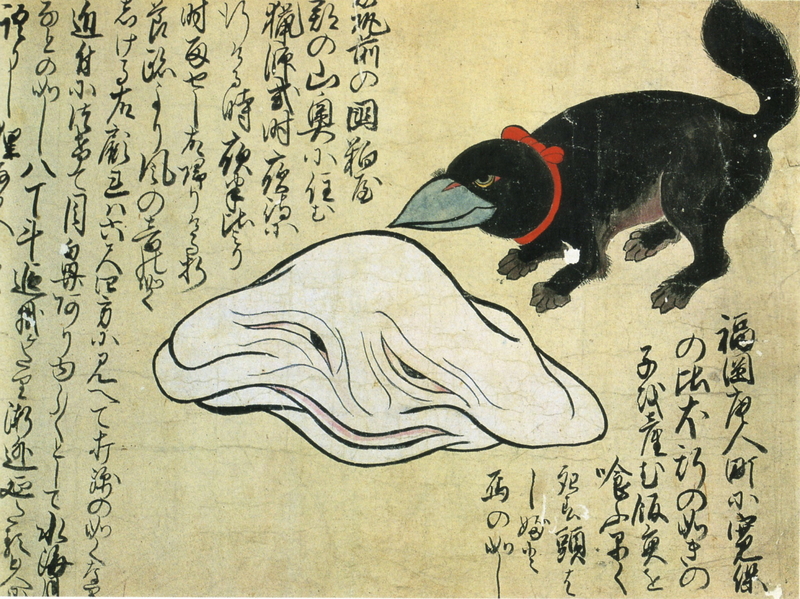 The black creature on the right was born by a dog that mated with a bird in the city of Fukuoka in the early 1740s. Next to the bird-dog hybrid is an amorphous white monster -- also encountered in Fukuoka -- which is said to have measured about 180 centimeters (6 ft) across. People at the time believed this creature was a raccoon dog that had shape-shifted. 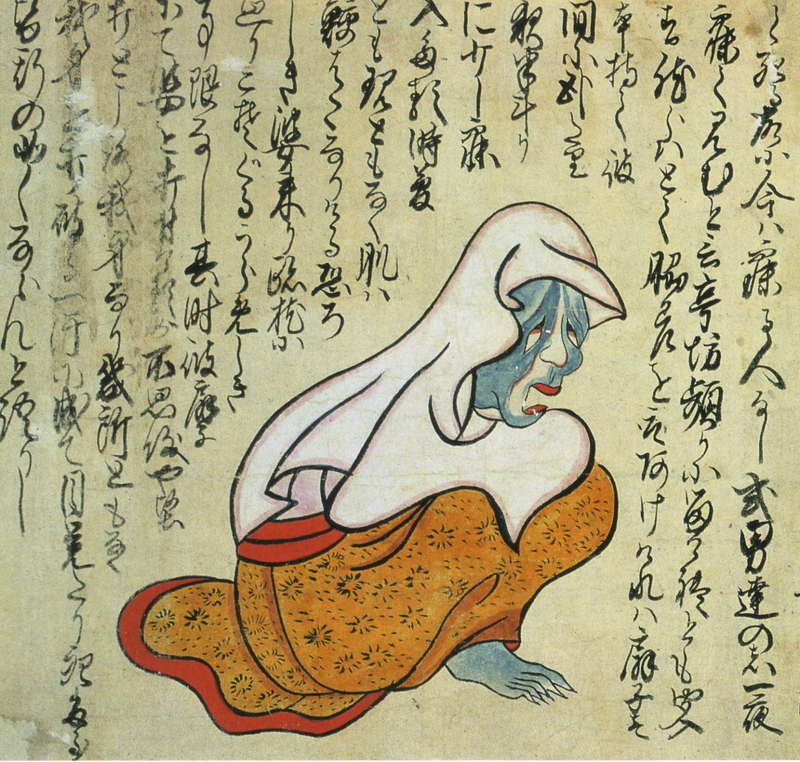 This illustration depicts a ghostly old woman known to appear late at night in a certain guest room at a temple in the Kaho area of Fukuoka prefecture. On multiple occasions, terrified lodgers ended up fatally wounding themselves after trying to strike her with a sword. 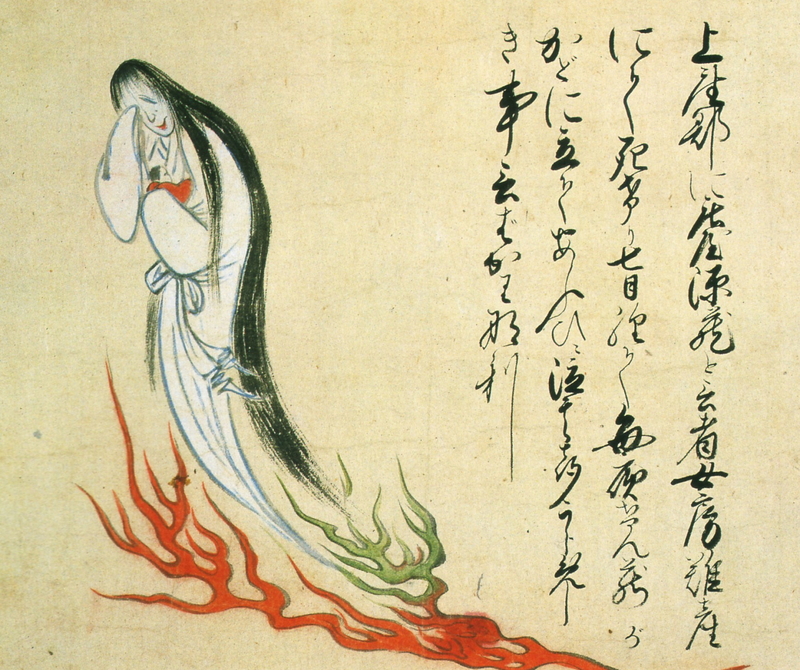 During heavy winds, this Russian hitodama (a fiery apparition composed of spirits of the recently departed) could be heard to say, "Oroshiya, oroshiya" ("Let me down"). 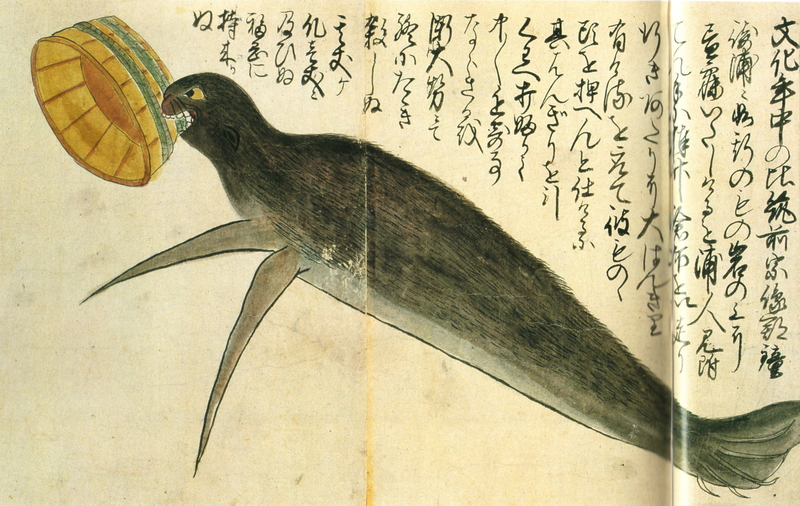 There is some speculation that the author dreamed up the creature based on a play on words, as "oroshiya" sounds like the old Japanese pronunciation of "Russia." 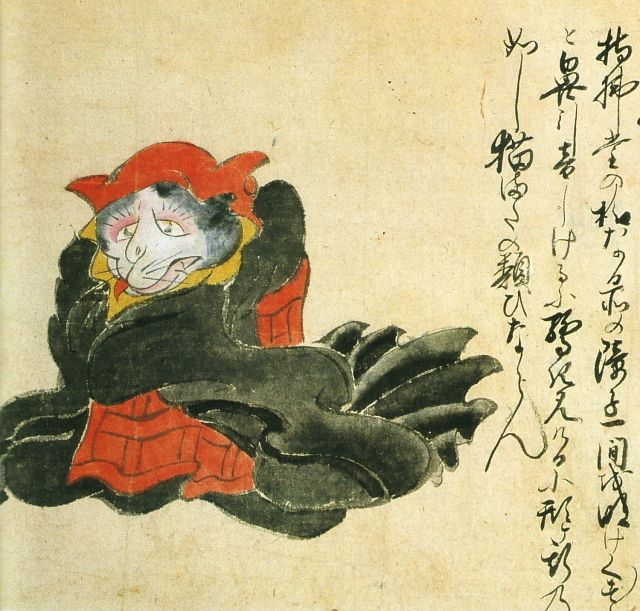 This illustration depicts a Zenshu priest who was transformed by greed into a strange feline creature with three toes on each paw and the forked tail of a nekomata. The illustration shows a fearsome horned toad said to inhabit the sea near Pusan, Korea. 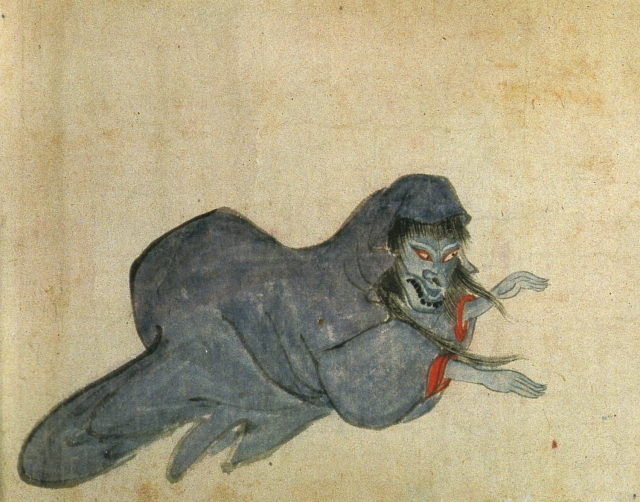 This creature resembles a half-naked, cold-ridden Chinese man and is thought to be a caricature of China, which had fallen prey to Western colonial powers. Long ago, a man with massive testicles reportedly made a living as a sideshow attraction at Mt. Satta, on the old Tokaido Road near the city of Shizuoka. His scrotum is said to have measured about a meter across. 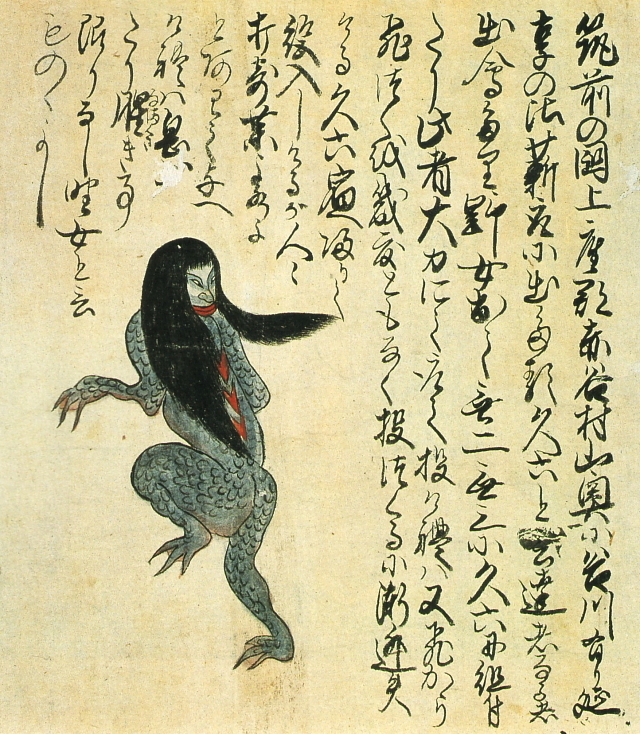 The "wild woman" shown here appears to be an aquatic humanoid with scaly skin, webbed hands and feet (each with three fingers and toes), long black hair, and a large red mouth. 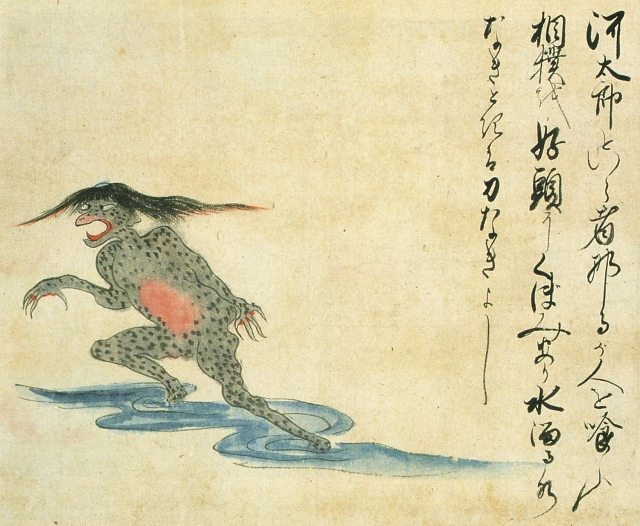 People claim to have encountered the creature in the 1750s in mountain streams in the Asakura area of Fukuoka prefecture. The "ox woman" pictured here was sideshow attraction at Dazaifu Tenmangu shrine (Fukuoka prefecture) in the mid-18th century. 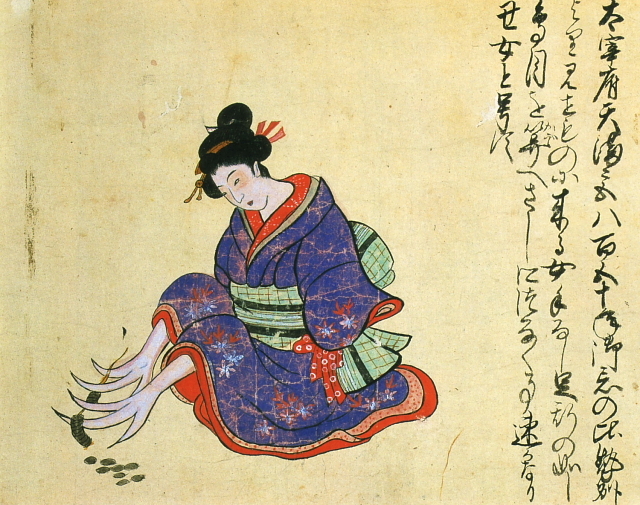 The armless lady entertained audiences by using her peculiar feet to run string through the center holes of coins. 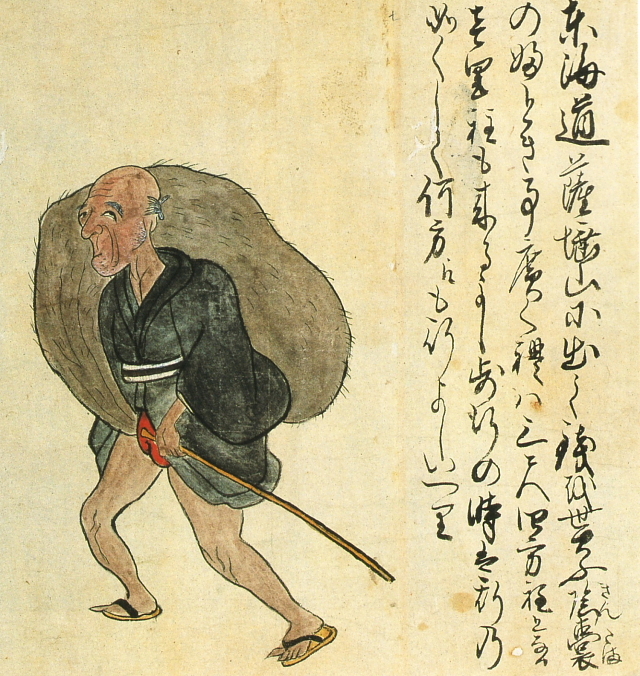 The illustration shows a middle-aged traveling monk from Nagano prefecture who would bathe in hot springs without removing his leggings. If anyone asked him why he did not fully undress before entering the water, he would show them the holes in his shins, which contained snakes. 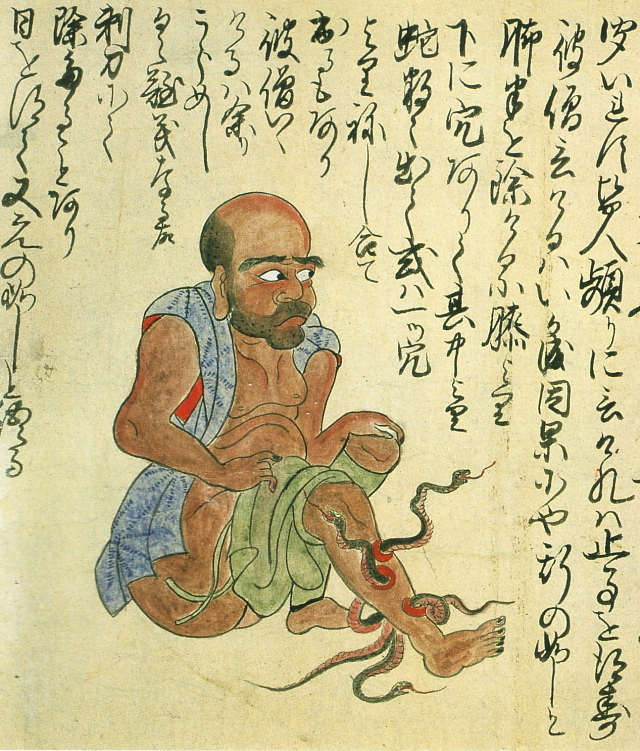 The man was born with snakes in his legs as punishment for misdeeds in a previous life. Many Edo-period scrolls featured illustrations of unfamiliar creatures -- animals that actually existed but were rarely seen in Japan (such as fur seals and sea lions), along with creatures generally regarded as imaginary (mermaids and kappa). This illustration shows a 3-meter-long seal that was captured in the early 19th century at Kanezaki Inlet. 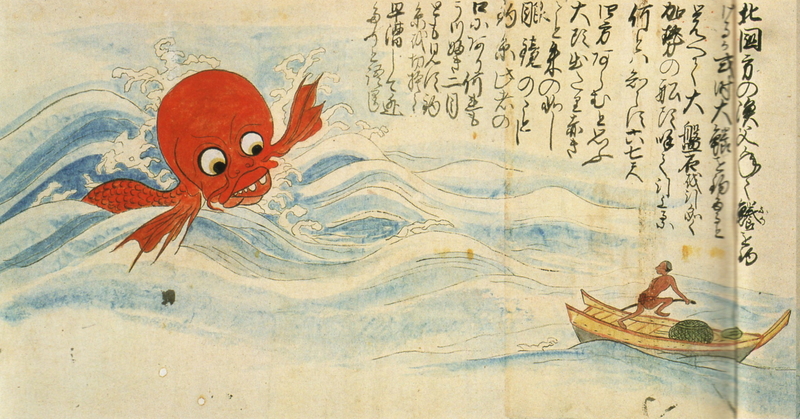 This illustration depicts a giant red fish encountered by a shark fisherman in northern Japan. 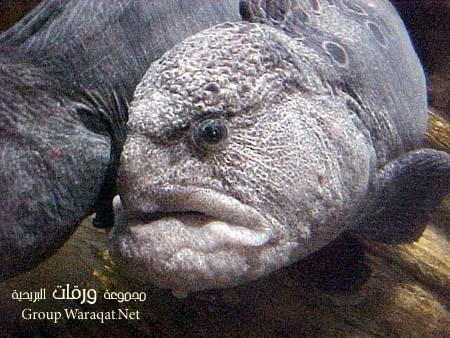 The head of the angry fish is said to have measured about 2 meters across. Much like the money-hungry priest described above, the people shown here have been transformed by greed into bizarre cat creatures. This illustration shows an Ezo Wolf (a.k.a. 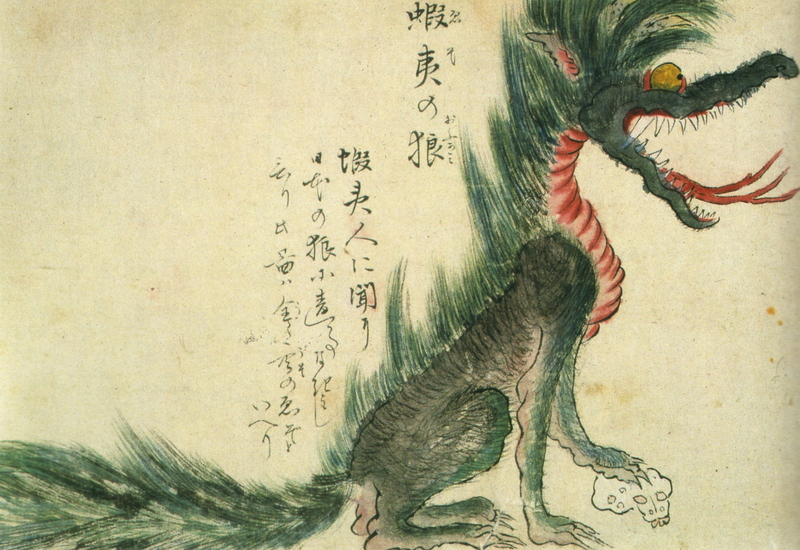 Hokkaido Wolf), which is believed to have gone extinct in the late 19th century (after this illustration was made). The animal is seen here with its paw on a human skull. 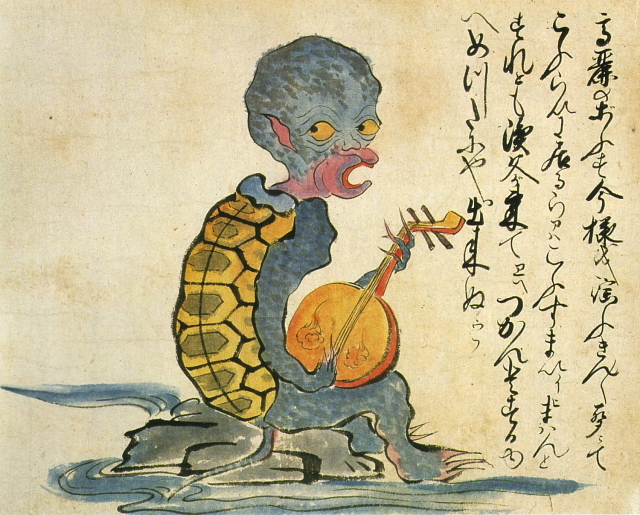 The "Korean monk" in this illustration, seen singing and playing a gekkin (moon guitar), has the physical characteristics of a kappa (water imp). In the early decades of the 18th century, a man with a malleable head made a living as a popular sideshow attraction. 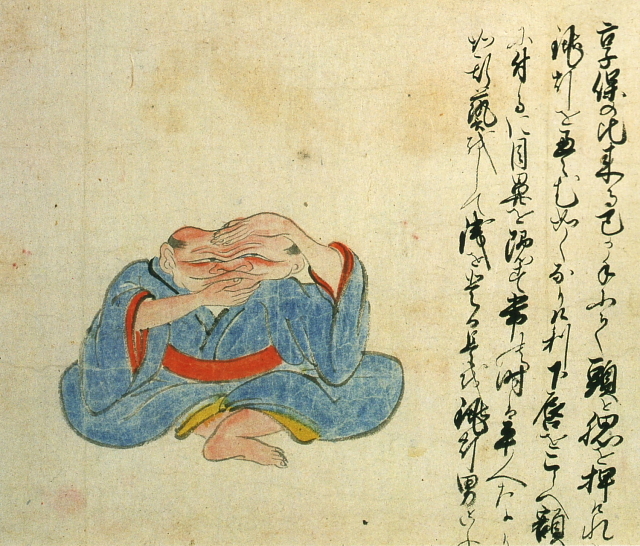 It is said that he could collapse his head like a traditional paper lantern. This illustration shows the ghost of a woman from the Asakura area of Fukuoka prefecture, who died during a difficult childbirth. The nekomata is a cat monster with a forked tail and a taste for human flesh. The creature's powers include the ability to talk, walk on hind legs, shape-shift, fly, and even resurrect the dead. 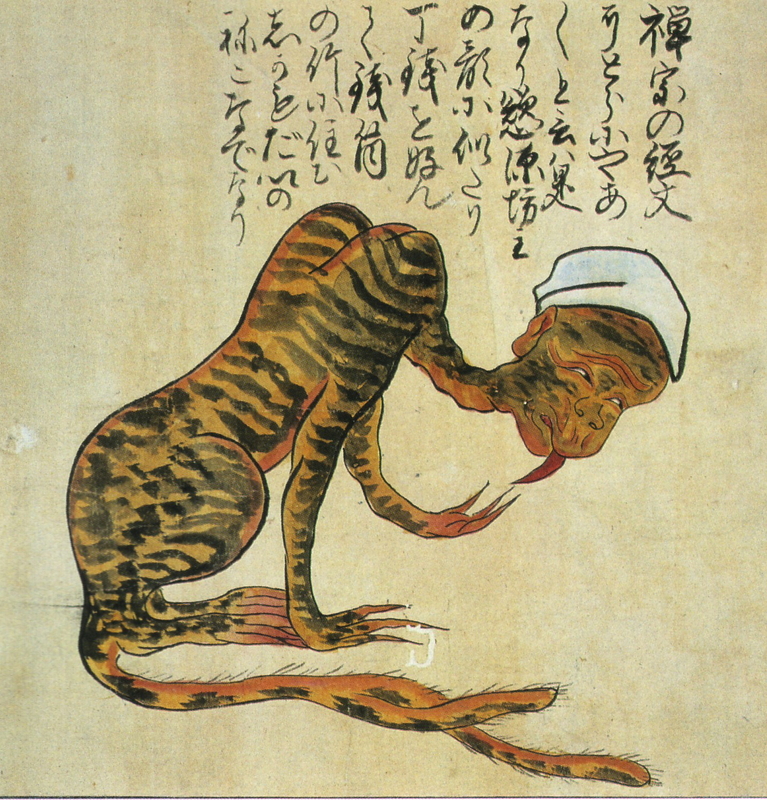 The nekomata pictured here was encountered in the Nasuno area of Tochigi prefecture. 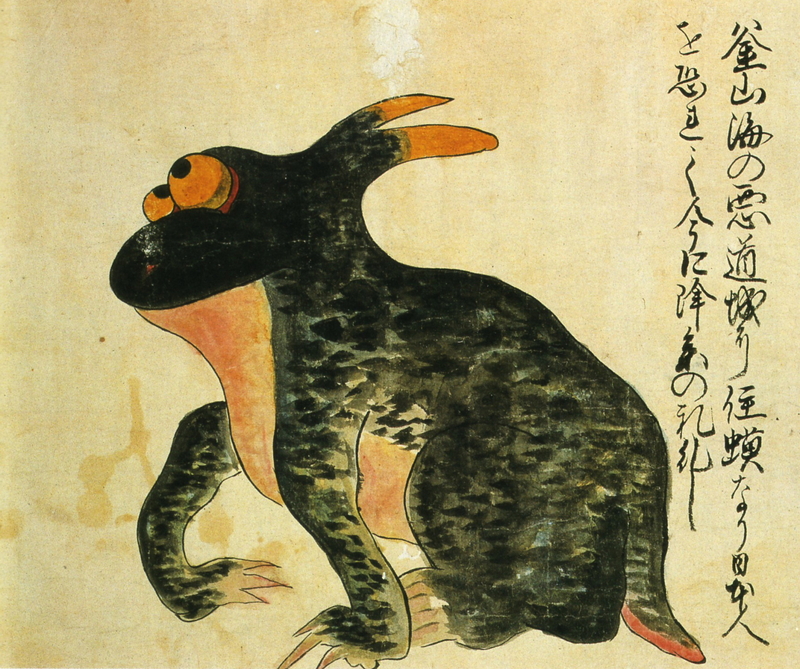 The kawataro is a variety of kappa (water imp) which, according to the accompanying text, likes to eat people and practice sumo. An indentation on top of the creature's head is filled with water. The kawataro becomes weak when the water spills out. 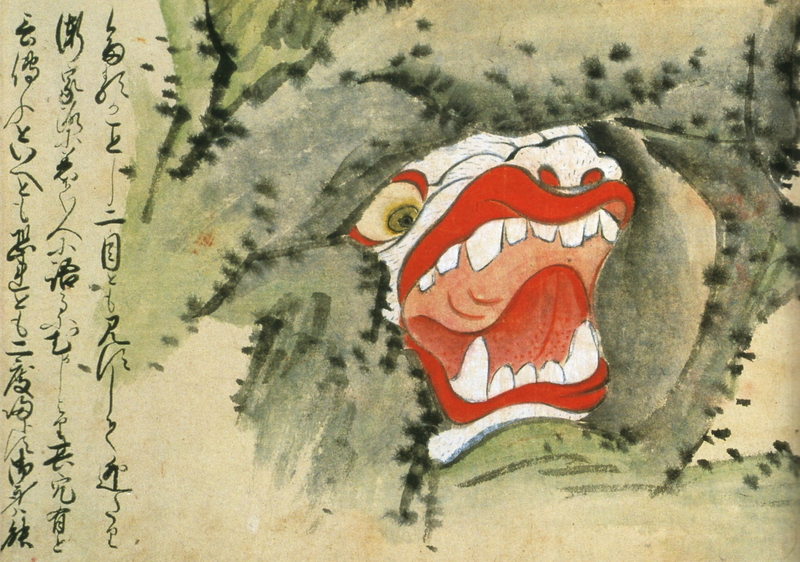 This illustration shows a monster cave believed to exist deep in the mountains of Kumamoto prefecture. At first glance, it looks like an ordinary cave. But as you approach the entrance, the eyes and teeth become visible. The snake woman pictured here was reportedly encountered by six people on Mt. Mikasa in Nara prefecture. Five of the eyewitnesses died instantly. The sixth person survived long enough to make it home and tell the tale, but he grew ill and died three days later. The snake-bodied woman resembles the notorious nure-onna, except that this one has a beautiful face. 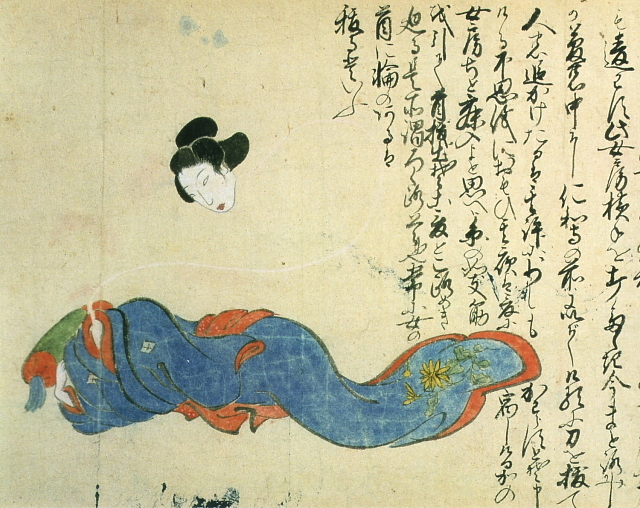 This rokurokubi -- a woman with the ability to stretch her neck to extraordinary lengths -- is said to have been encountered by a messenger one night near Ninna-ji temple in Kyoto. The mikoshi-nyudo pictured here was encountered by a peasant on the road late one night in the Naka area of Fukuoka prefecture. 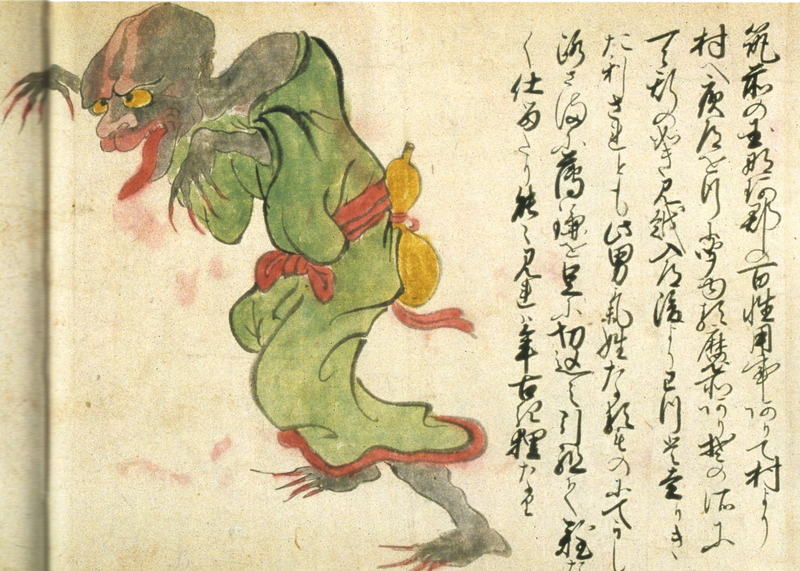 Although no explanation is given for this creature, it seems to resemble the notorious gagoze, a demon who attacked young priests at Gango-ji temple. I like these posts. Where do you get the prints from? Anyway, are you getting the information about the creatures from the calligraphic text next to the drawings? If so, how did you learn to read the script? I read modern Japanese but here I am only able to identify some kanji and kana, although except from the calligraphic brush strokes the characters seem to be more or less identical to the modern versions. The images were scanned from the book 'Youkai hyakumonogatari emaki' (妖怪百物語絵巻) published by Kokusho Kankokai in 2003. Fortunately it includes a transcription of the cursive script, along with some notes on the old Japanese and a little commentary about each monster. And for the other creatures that looks like human, it seems like they were just some people with deformed body, probably since birth. That's so cool... but i wonder where the drop-bears are? LOL You gotta feel sorry for the guy with the over-sized testicles! I saw a guy on TV from southeast Asia with what I believe they called testicular elephantitus or something like that and he pushed his scrotum around in a wheel barrel as it was about a meter across. Remember those red rubber balls with the handle that kids hopped around on, or for that matter that one South Park episode? Well, it looked like that but with more wrinkles. "The man with snakes in his legs" was probably suffering from Guinea worms. They're a type of parasite that lives under the surface of the skin, emerging from blisters when the skin is placed in water. While they aren't snakes, their long tubular bodies do resemble them. The man with snakes in his legs had "guinea worms"!!! He was a real man. 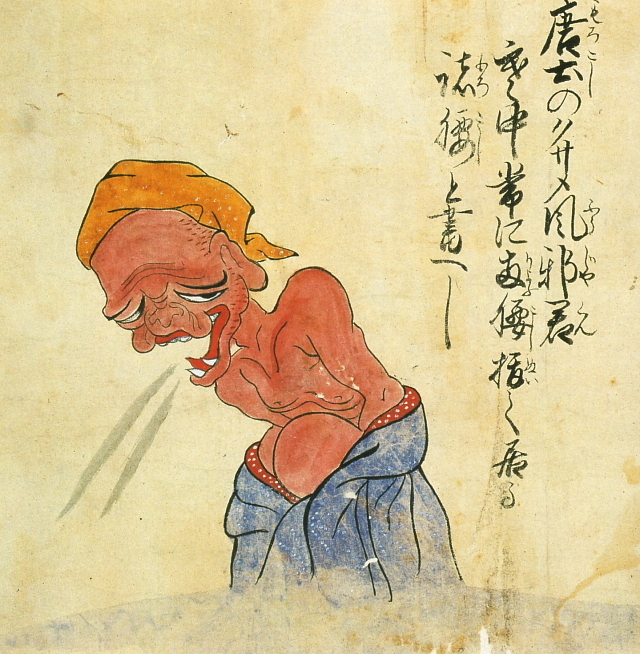 It's a parasite not generally found in Japan, but historically COMMON in the middle east and Africa. This parasite has almost been eliminated in modern times, but was once well-known if not well-understood in the areas of the world it flourished in. It's thought that the process of slowly extracting the worms by winding them around a stick inspired the Rod of Asclepius. It's also thought that this parasite was the "fiery snakes" mentioned in the Hebrew portion of the Christian bible, as they were commonly found in this portion of the world. The illustration shows a middle-aged traveling monk from Nagano prefecture who would bathe in hot springs without removing his leggings. If anyone asked him why he did not fully undress before entering the water, he would show them the holes in his shins, which contained snakes. The man was born with snakes in his legs as punishment for misdeeds in a previous life." Because the other host of this parasite was not present in the area, his parasitic infection would not have spread. My favorite is the monster cave. Very interesting overall. Thank you for posting this! The White Monster reminds me of the "elderly fish." The first one looks a lot like a platypus and a blobfish. Just pictures of my Wife when she is in her moods. 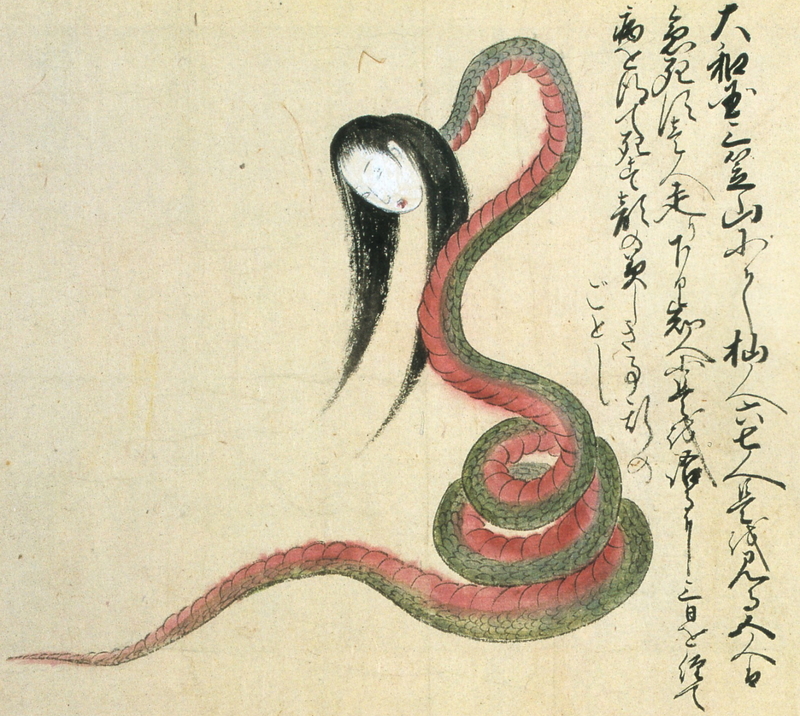 I love the rokurokubi - she is supposedly a nosy neighbor demon who stretches her neck to listen in on gossip. At least, that's what one of my friends told me. I've seen her (and variations) in a lot of Toshio Saeki art. Wow. They were making up Pokemon even back then. "Chinese Sneezer" ..... when China was known as the "Sick Man Of Asia". Well at least it makes sense! ‘Kaikidan Ekotoba’ monster scroll « CONSPIRAPORN! Warranty Void if Seal is Broken « Comics! Games! Anthropology!